I’ve been through a lot of time-telling devices in my years. My dad made sure I could read an analog watch as soon as I could put one on my wrist, and I think I’ll always have some sort of sentimental attachment to time pieces. There are so many ways to display time, it’s no surprise that there are plenty of App Store offerings vying for that essential position of letting you know how much longer you’ve got to wait until lunch. Take Flip Clock and DeskClock. The former offers little more than its name implies, while the latter provides a bit more information in a clean and straightforward interface. Day By Day: In addition to its clock features, DeskClock tells you what day it is and displays a monthly calendar. Chilli X’s DeskClock is essentially the iPhone equivalent of the kind of digital desk clock you’d buy from an electronics store. It tells you the time in big bold letters, along with the current day and a small calendar. DeskClock’s customization features are relatively scant; your options are limited to changing the border around the time to red, green, blue, or gray, setting the time to a 24-hour clock, and selecting whether to start the the week on a Sunday or a Monday. You can’t set any alarms or access any information from your calendar from within Desk Clock. The app auto-locks itself, preventing your iPhone or iPod touch from going into sleep mode and turning off the display. 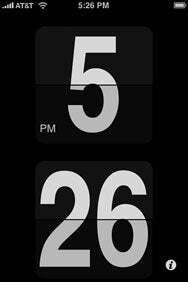 Two Views: Flip Clock displays the time in portrait mode as well as in landscape view, depending on which way your iPhone or iPod touch is oriented. Flip Clock from Larva Labs offers a much more stripped-down approach. It features a clock and nothing more. Flip Clock’s theme is a traditional flip-style clock, which orients itself in whatever direction you’ve set your mobile device. The flip is fully animated and combined with a sound, which sounds more like a laser gun than a flip clock. Options for this app include a 24-hour mode, turning off auto-lock to keep the app open, hiding the iPhone status bar, turning the flip sounds on and off, and adjusting the brightness. While you can’t make any adjustments to the appearance of the clock, its default setup is bold and easy to read. Both Flip Clock and DeskClock make fine desktop companions with easy-to-read displays. The choice comes down to whether you’d prefer a simple clock or something slightly more robust. Flip Clock offers bold simplicity and old-fashioned styling with absolutely no bells or whistles to speak of, while DeskClock gives you a full month calendar with equal legibility and the same amount of options. If you really like the idea of having a calendar available to you at a quick glance, then DeskClock could be right for you. However if you like to keep things simple, perhaps Flipclock has a home on your desk next to your kitten-a-day calendar. 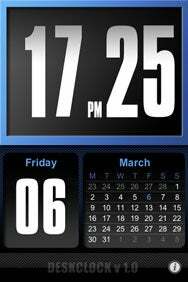 DeskClock is compatible with any iPhone or iPod touch running the iPhone 2.x software update. Flip Clock runs on iPhone 2.2 and later.